Fancy a portrait of yourself or looking for a custom gift for your BFF? Sri Priyatham — a renowned artist — can recreate your favourite portraits or even turn them into caricatures. Sri Priyatham is your boy-next-door, pop-culture geek who happens to moonlight as an artist. But for the most part, he is a trained artist who graduated with a degree in illustration. As someone who believes in self-learning and deriving inspiration from the surroundings, Priyatham has come a long way from his first sketch — Popeye (at the age of 12) to the sketches that are now internationally famous. While the walls of MNCs worldwide have embraced his illustrations, he is also popular in the city for his commission-based portraits that work wonders as gifts. What truly stands out in his sketches is the killer attention-to-detail and if you notice his work, you’ll observe how significantly the facial features like eyes, nose, creases etc. leap out. His approach to the illustrations begins in the initial stages where he understands not just the requirements but also observes the subjects of art keenly. Developing an idea on the amount of effort taken, time and price are quoted. The pricing is usually between INR 5,000-INR 25,000 and he takes anywhere between 3-10 days. When the idea is approved by the client, he starts with sketching, colouring (if required), and then a final output is done. Apart from a digital copy, he shares a physical one too. 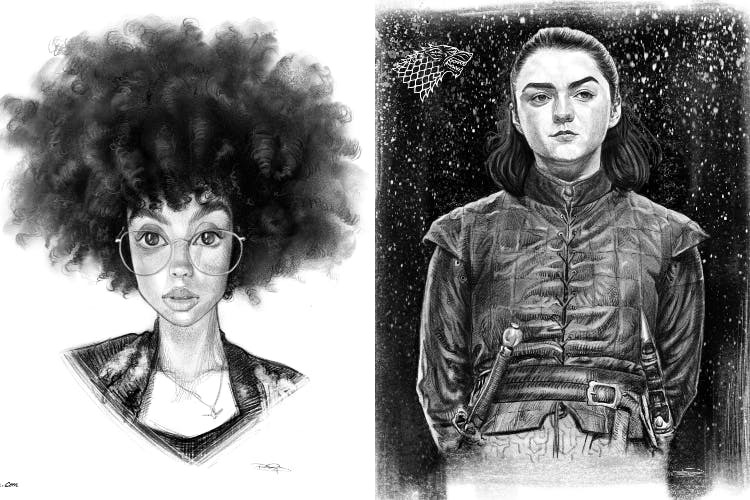 He barely takes hours to sketch illustrations based on TV shows and movies. If you cannot think of a way to surprise bae or parents but want them to cherish a present (forever), you might want to explore what Priyatham can do for you. Whether you’re looking for a comical caricature or a family portrait to pin up on your wall, he’s got to be your guy. The wait time can be sometimes longer, but it'll be worth it when you hold his artwork. He often conducts pop-up sales on Instagram or Facebook where you can grab these sketches at INR 999-2,000 and the Moleskine (which is quite an expensive paper) ones are usually charged a little higher. Plus, he has been hosting art workshops across the city (at a nominal price) with an intention to build a solid art community within the city and teach art enthusiasts a thing or two about basics.